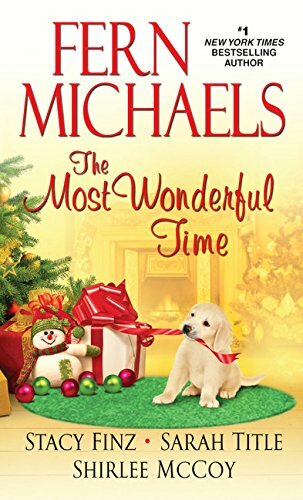 The forecast for October is a flurry of Christmas romances, many of them anthologies. This book is one of the latter group with a quartet of stories from popular Kensington authors. Overall, my reaction was mixed: one story was a big fail for me, one was disappointing, one was an enjoyable read that left me looking forward to other visits to a new California town, and one was a satisfying addition to a series I like a great deal. “Christmas Passed” by Fern Michaels is the story of Brandy Heyers who is still mired in grief three years after the death of her husband. Her grief is so paralyzing that she is oblivious to the needs of her two teenage children, and she sees no reason to celebrate the holidays without her husband. The reality of diminishing resources and a live-wire best friend who refuses to give up on her force Brandy back into the land of the living. She gradually becomes aware of what she is doing to her children and even, with the help of a widower with a big heart and a charming young daughter, begins to believe that she has a second chance at love. I really disliked this heroine, and even a sympathetic hero and likeable secondary characters were not enough to make up for that irritant. I also thought the quick wrap-up to the idyllic, everybody’s-happy conclusion was beyond belief. “A Glory Junction Christmas” by Stacy Finz is an interesting twist on a friends-to-lovers story. Hannah Baldwin has had a rough year. Her husband of nine years asked for a divorce when she picked him up after his ninety-day stint in rehab, and now she is the only person in Glory Junction not attending his wedding to his new love. She also lost her beloved aunt to ovarian cancer. Still, Hannah is working hard to make her first Christmas in charge of Glorious Gifts, the shop she inherited, a spectacular one. Josh Garner, her ex’s best friend, is back in town, but Hannah, who is convinced Josh never liked her, questions whether she should be part of his homecoming celebration. Josh is uncomfortable with the hero’s welcome his hometown insists on giving him after his return from Afghanistan. He just wants to focus on his physical rehabilitation. A war wound left him with a leg held together with plates and rods, and Josh is not sure what that means for his future with Garner Adventure, the extreme sports and adventure business his family owns and operates. In any other circumstances, Josh would be elated that Hannah is free. She has had a claim on his heart for years, but his best friend Chip charmed her and married her. Josh tried to forget her, with little success. If only his future didn’t look so uncertain, maybe he’d have a chance with Hannah. If these two can let go of misperceptions and fears, they just may find an HEA in the new year. This novella introduces Finz’s Glory Junction series, a spinoff of her Nugget series. Hannah and Josh are engaging, substantive characters who deserve an HEA. And, despite the limitations of the novella’s length, Finz gives her readers a clear sense of the town and provides glimpses of some very interesting secondary characters, especially Josh’s brothers. I will definitely be on the lookout for more of Glory Junction and its citizens. “Moonshine and Mistletoe” by Sarah Title is another of this author’s librarian tales. Only her dissertation separates Emma Fallader from a PhD in library science, and she hopes she will find some time for work during her stay in Coral Bottom, West Virginia, where she is spending a few days before Christmas to attend the country wedding of her friend and fellow librarian Kevin to his long-time partner, architect Daniel. Emma doesn’t expect the wedding to be a life-changing event for her, but a certain fiddler and a tiny, charming library have Emma rethinking what she wants to do with her life. Abe Tate, a musician with genuine talent and a love of the traditional music of his region, is happy to be back in Coral Bottom. He would never miss the wedding of his cousin Daniel who is as close as a brother, but he has also missed home. The reality of Nashville has fallen short of even his modest dream of earning a living with his music. This time at home has him reconsidering old choices and thinking about new ones involving the pretty librarian who has captured his heart. I like Sarah Title’s voice, and I find her humor and her quirky characters enormously appealing. However, this story felt incomplete. Both Emma and Abe are experiencing career conflicts, but the novella length prohibits any real exploration of these issues. Emma and Abe meet and fall in love quickly, and there is no conflict to their love story other than the distance that will separate them once they leave Coral Bottom. The perfect ending came too soon, and it felt unearned. I finished the novella wishing for the more that a novel would have offered. 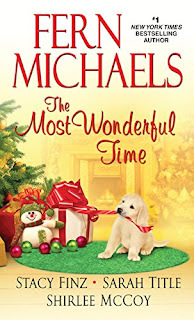 “An Apple Valley Christmas” by Shirlee McCoy features Emma Baily, a secondary character in McCoy’s Apple Valley trilogy, and Jack McAllister, a man from Emma’s past. Emma has just buried her father after four years of caring for him while Alzheimer’s slowly destroyed him. Emma is the only one of the ten Baily siblings who is present for their father’s funeral. None of them shed a tear for the mean-spirited, selfish man who had blighted their lives. Emma returned to care for him only because of a promise made long ago to her mother. Now Emma, who is the only heir to her father’s considerable estate, wants to sell the house that has been in her family for generations and leave behind Apple Valley and her unhappy memories. Jack McAllister walked away from Emma six years ago because she could not trust in their forever, but he is in Apple Valley now. He is there because his friend and Emma’s brother Adam asked him to be there for Emma, but he is also there because he has never forgotten Emma. This time he has vowed to be more patient. This Time he won’t give up; he will take the time to show Emma that Christmas is for celebrating and love and life are for sharing. This was a lovely Christmas story. I read and enjoyed McCoy’s Apple Valley books, and I thought, particularly after reading The Cottage on the Corner, that Emma deserved her own HEA. Emma’s caution was credible given all that she had been through, and Jack is a wonderful beta hero. He woos Emma with understanding and tenderness and wins the reader’s heart as surely as he wins Emma’s. The touch of Christmas magic and the warmth of the Apple Valley community even in the depths of winter made the story even more special. I thought this one was an unqualified winner. I haven't read her in a while - this sounds like a lovely story! Although this is not a genre that I read, it does sound quite lovely. Thank you for the reviews. This one sounds like it needs to be an addition to my Christmas book collection.